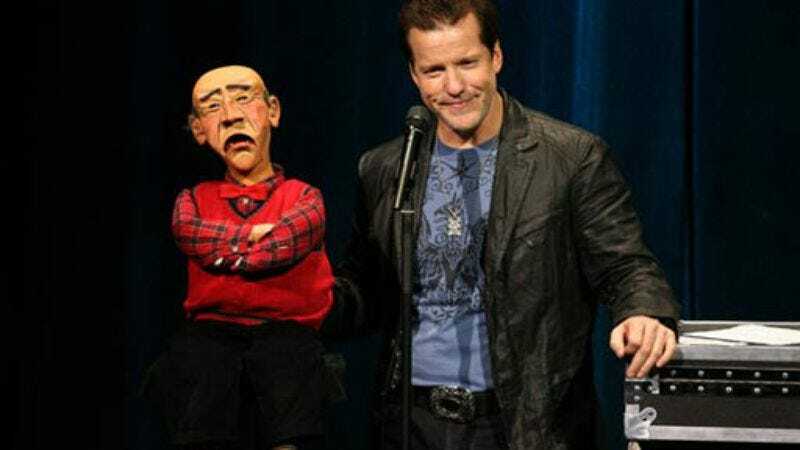 Last week we fretted over our place in a universe ruled by a divine being so cruel as to allow The Jeff Dunham Show to draw a record 5.3 million viewers for its Comedy Central debut. This week we feel somewhat heartened by the news that Dunham's little puppet show fell to 2.3 million viewers for its second episode. But only somewhat. For one thing, that only takes into account the number of people who watched the episode's first airing, not its replays. (The first episode had 2.6 million viewers for its repeat later that night.) For another, 2.3 million viewers still outperforms the average episode of Mad Men. So we still have our eyes on you, God.